Read the review by Independent Professional Reviewers (Sholander) of “The TurnKey Investor’s ‘Subject-To’ Mortgage Handbook”. Take an investment property subject that’s potentially challenging to grasp, get an expert investor to explain it, and what do you have? 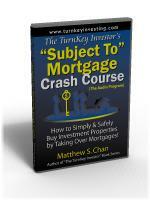 Matthew S. Chan’s simple-to-understand book, The Turnkey Investor’s “Subject To” Mortgage Handbook. The author does a superb job of explaining what “subject to” means, how and when it applies, and how it can benefit both buyer and seller. Risks and advantages are explained in great detail – nothing’s left out. Chan even cautions against misusing this method. Only ethical, honest investors and sellers need apply! What is “subject to?” To get the full picture, you’ll have to read the book, of course, but in short, it’s a form of seller-financing. It’s a specific technique for buying and financing property subject to the terms of the existing loan. It’s a way for experienced investors to build their portfolio of properties much faster and, in most cases, more cost-effectively. 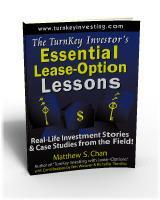 Right from the start, Chan emphasizes that this book is written for the experienced, not beginning, investor. It’s easy to see why. The “subject to” technique is not for everyone. In significant ways, it differs from a typical real estate transaction, requiring greater knowledge of real estate and mortgage laws, sound business sense, strong ethics, and the ability to negotiate fair terms for everyone involved. So if you’re a beginning investor, this book isn’t for you. But if you’re an experienced property investor, then you’ll find the technique outlined in The Turnkey Investor’s “Subject To” Mortgage Handbook intriguing and very possibly appealing. Chan guides you step by step through the ins and outs of “subject to.” The writing is so lucid that even someone without a financial or real estate background can understand the concept. 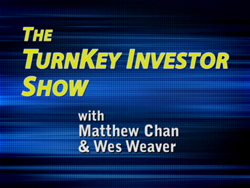 Because it’s a fairly advanced method, though, try it only if you’re an advanced investor. 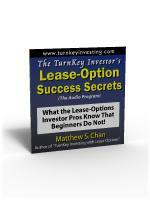 Chan carefully explains cases when “subject to” provides a win-win situation for buyer and seller alike. For a seller who faces foreclosure, for example, a “subject to” transaction can be a lifesaver. For a serious investor looking to purchase properties at a faster pace, “subject to” can be a very attractive option. 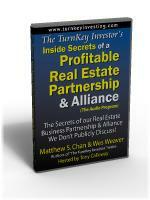 With editorial contributions by Wes Weaver, real estate investor, real estate agent, and property manager, this book is well-rounded and thorough. 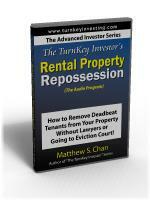 It accomplishes what the author and contributor set out to do – it offers the mature investor a clear, concise, easy-to-read, and definitive guide to buying property using the “subject to” mortgage technique. Chan has conducted a great deal of personal research and has spoken with many attorneys and lending institutions to ensure that “subject to” is both legal and ethical. Having completed his research and having found success with this technique, he’s now created a clear manual to help other investors interested in this type of transaction. 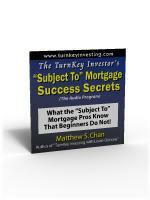 The Turnkey Investor’s “Subject To” Mortgage Handbook can easily stand alone, or it can be paired with the accompanying CD audio program, The Turnkey Investor’s “Subject To” Mortgage Success Secrets for a comprehensive package. 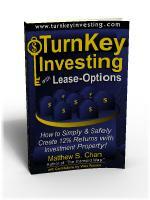 Matthew Chan’s handbook is an intriguing must-read for the advanced property investor. © 2004-2016 Matthew S. Chan. All rights reserved.